A case of rabies in a dog has been confirmed in Protea North, Soweto. Ø It is compulsory for all dogs and cats to be vaccinated against rabies. Failure to vaccinate domestic pets is illegal and is a public health risk. Summer is here, and with it the popular Montego Classic Night Series. There will be food and drinks on sale from the committee. We hope to make the admin of your Dog Agility life easier with this website. Everything is available right here - a calendar to plan your months ahead, the latest schedules as and when they become available, and finally the results of the previous shows. If you are looking for a Club or trainer near you, check out our new "Training" page. As the site grows we may find additional useful items to add, so be sure to check back often. If you want to show your support for the Team, purchase a supporter's T-shirt @ R 90. 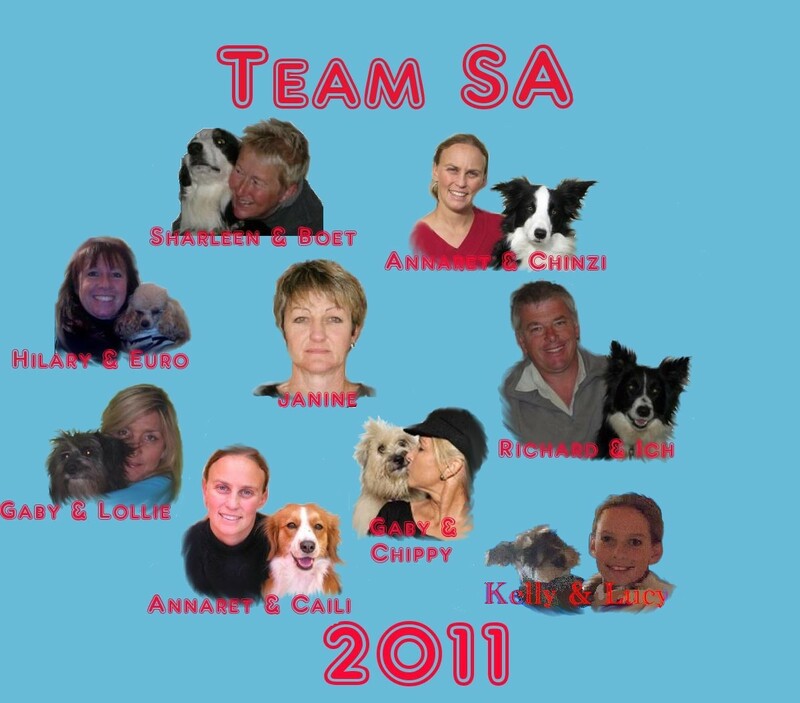 Large Team: Chi, Ich, Shandy (already at flyball when the picture was taken) and Zee. The Gauteng Medium Team was second with: Bijou, Chippy, Misty and Rusti. Based on the great success of the Lee Gibbson seminars in 2011, we are pleased to announce that he and Lucy Osborn will be in Gauteng in January 2012. The provisional dates are 16th to 26th of January. The Gauteng Dog Jumping League is back!! And of course the Gauteng Agility League too!! If you haven't done so already, you may also find it useful and fun to join the saagility chat list. Open to all Agility enthusiasts, we even have some international participants. ..... and while you and your dog are having fun, please do not forget the less fortunate - please visit this website daily and click to give food - it's free but you will make a big difference. A HUGE Thank You to Melissa Wilson for providing most of the photographs on this website. Contact Melissa for pictures of your dog.